from a disappointing opening day to romp the Pirates 9-3.
two earned, while pushing through a scoreless seventh inning on fumes. young players are bringing to the Cardinals this year. walked Duncan to get to Khalil Greene, who doubled in two runs. that Molina’s speed is “deceptive”. into third as the third baseman mishandled the throw. Safe. A triple. The second of his major league career. something about how slow Molina is, then added, “He’s such a lard a**”. one does in a cat fight. wanted there to be no doubt she was the idiot. chilly October night in 2006.
news: It is Opening Day. Summer is here! I was home from work today. reason I was home was because I was sick. It was a two Kleenex box day. Cardinals and the Pittsburg Pirates. got the first loss and blown saves out of the way. We can concentrate on winning now. the heat for walking his last two batters. infielders had big opening days elsewhere. each side of the plate. Go figure. 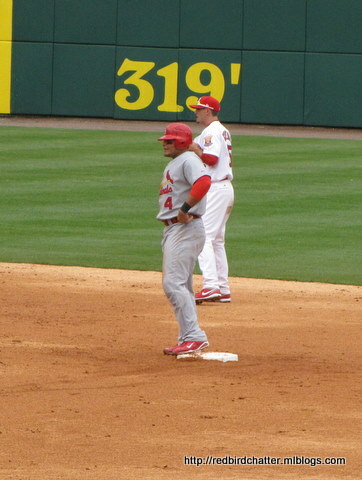 his and the Cardinals first RBI. 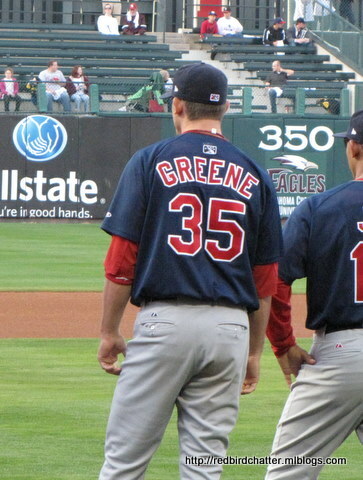 Welcome to St. Louis, Mr. Greene. help himself any way he could. with two singles, a double and an intentional walk. a run scored by pinch runner Joe Thurston. edge. Take a deep breath. In with the good air. Out with the bad air. Put it in a bubble and blow it away. The Cardinals are going to be just fine.